"Katie was extremely accommodating, personable, knowledgeable and hard working. She really listened to our needs/wants and always remained patient and positive through our process. Katie genuinely cared about finding us the perfect home. In a stressful time of transition (moving across country), we could not have asked for a better realtor. We will always recommend Katie to anyone in search of their perfect home. ."
Since 2005, when Susan and Howard Meyers stepped on the North Shore real estate stage and earned North Shore Barrington Real Estate Board “Rookie of the Year” award, The Meyers Group has been a leader in North Shore real estate, garnering more than $200 million in sales. Susan and Howard entered their real estate careers with financial acumen – Susan as a small business owner and Howard as a trader – and a shared passion for renovation and the joy of transforming houses into warm and elegant homes. The pleasure they derive from helping clients through the buying or selling process permeated their family life. That’s why their daughter, Katie, chose to join The Meyers Group in 2015 after a successful career in luxury marketing. 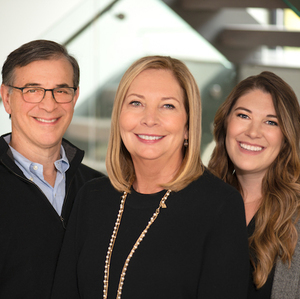 With more than 33 years of combined real estate experience, Susan, Howard, and Katie bring expertise in renovation, interior design, economics, and marketing. The Meyers Group knows both the Chicago and North Shore real estate markets, so whether you are moving from the city to the suburbs or the suburbs to the city, they can provide a seamless transition. What’s more, when you work with one member of The Meyers Group, you gain the benefit of all three. Through their daily meetings, they ensure that each agent knows every client’s needs and can work together to offer you optimal service and greater continuity.